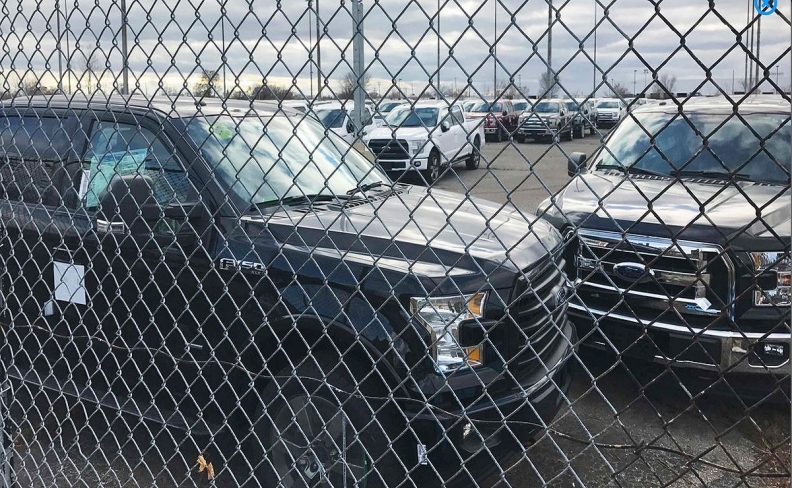 Several hundred F-150s were stored earlier this week behind a chain link fence on an empty factory parking lot in Detroit. Ford Motor Co.’s 2017 F-150 and Raptor trucks with a new 10-speed transmission began arriving on some dealer lots last month, but the automaker said it is holding some models for additional testing as part of its normal launch ramp-up. Ford began delivering 2017 F-150s in October, but the first trucks with the new 10-speed transmission and second-generation 3.5-liter EcoBoost engine began shipping a month later in November, Ford spokesman Mike Levine said. Ford had previously said the F-150 with the 10-speed transmission would ship by mid- to late October. The Wall Street Journal reported Monday that shipments were delayed by a month as Ford worked out an undisclosed issue with the new gearboxes, but noted it had since been resolved. At least one local dealer last week was told in a call with Ford that the vehicles were “on hold,” but a reason was not given. Levine said holding new models, especially with new engines or transmissions, is a common practice for all of Ford’s vehicle launches. “Building and holding new models for additional testing is a quality process that has been part of our standard for more than a decade,” he said. The 10-speed transmission, jointly developed with crosstown rival General Motors, is available on the 2017 F-150 pickup paired with the new V-6 EcoBoost. The transmission features optimized gear spacing for improved acceleration and towing, and uses steel, aluminum and other composites to save weight. Ford earlier this year announced plans to spend $1.4 billion in upgrades to its Livonia Transmission Plant for the new 10-speed transmission. The investment created 500 jobs.